Silver BlackBerry Passport leaked | BlackBerry Blast! There have been several rumors about a new BlackBerry, but it looks like we now have some proof. BlackBerry will apparently release a new silver Passport codenamed "Dallas." 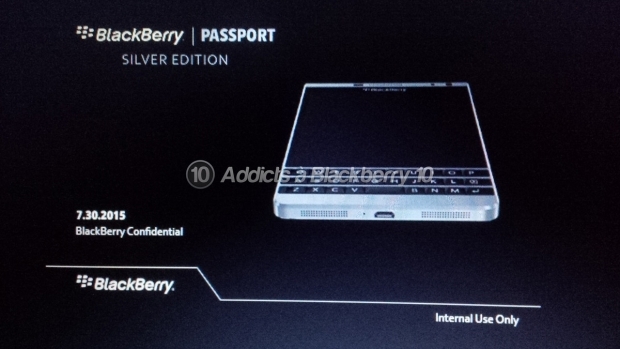 A picture of the new silver Passport showed up on BlackBerry10 FR. The specs of the silver Passport are the same as the current BlackBerry Passport, but the body is getting a slightly different design. It also appears the new silver Passport will be made out of aluminum. We do not have a release date for the new Passport, and we don't know what carriers will offer it. Will it be an exclusive? Is it coming to the US? We won't know the answers to these questions until BlackBerry makes the official announcement.